Los Angeles, Dec. 11, 2018 – Ryan Coogler’s “Black Panther” was named the year’s Best Film today by the African American Film Critics Association (AAFCA), the world’s largest group of black film critics comprised of leading film critics from across the country. The groundbreaking blockbuster also won Best Director (Ryan Coogler) and Best Song (“All the Stars” performed by Kendrick Lamar and SZA with music and lyrics by Kendrick Lamar, Anthony Tiffith, Mark Spears, Solana Rowe and Al Shuckburgh) making it AAFCA’s top award-winner of 2018. 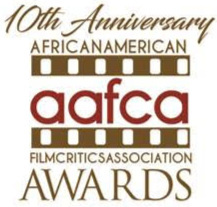 AAFCA also announced winners in several other categories, along with its annual top ten list, with all categories voted on by AAFCA members. Several special achievement awards will be announced in the coming weeks including the Cinema Vanguard Award, the ICON Award, AAFCA’s Stanley Kramer Award and the organization’s inaugural Pioneer Award. The AAFCA Awards, sponsored by Nissan, Home Depot and Morgan Stanley Global Sports & Entertainment, will take place on February 6, 2019 at the Taglyan Complex.